While full-device skins can be a good solution for iPhone owners looking for scratch protection without using a full case, those with Jet Black models should exercise caution when applying or removing the plastic wrap. A small number of iPhone 7 Plus owners with Jet Black models have noticed the text printed on the back of the device, such as "Designed by Apple in California," becomes transposed onto the skin upon being removed from the device. 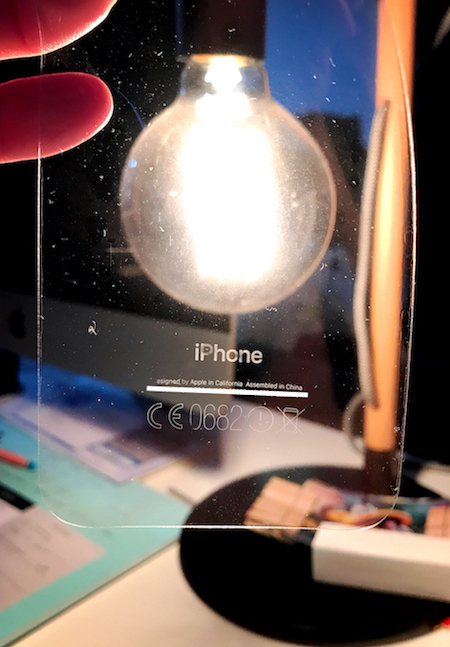 MacRumors forum member ksyu found out the hard way when he removed a full-device skin from his iPhone 7 Plus and noticed the letters transferred onto the plastic. Under bright light, all of the rear markings, including "iPhone" and the required regulatory labels, are easily distinguishable. "I had a normal protector on for about 1 minute and took it off," he said. "The writing peels right off." The writing actually came off onto the clear Slickwraps just like pulling silly putty off of a newspaper comic strip. If you're one of the people hoping to keep their phone in brand new out of the box condition this might cause a problem for you. I don't know if the writing came off because the wrap is sticky or because it was a wet install meaning getting your phone wet then drying the phone could lead to the writing rubbing off. The fine print does not completely come off the iPhone, but it does become faded. This type of issue has not affected previous iPhone models, nor does it appear to affect Black, Gold, Rose Gold, or Silver colors. Apple says the high-gloss Jet Black finish is achieved through a precision nine-step anodization and polishing process, but it remains unclear why the letters are rubbing off for some users. Fortunately, the problem does not appear to be widespread, but full-skin aficionados should be extra careful. I'd call that a feature. So, sounds pretty awesome? An even more clean looking jet black iPhone. Just another reason to avoid Jet Black. It was a marketing showpiece, not ideal for daily use.